There’s no denying it. The summer holidays are over. The schools reopen. The cars and the traffic gets back. Everybody’s a bit gloomier. But don’t worry. It’s not all that bad. If you have the case of a pre-autumn blues, there are a few food-related events that will cheer you up. And yes, most of these serve alcohol. Jeez, why do you always ask about that? This is where we’d go. Oh boy, it seems that the weekends now seem to get busier than the weekdays, with all the events happening in Prague on a regular basis. Sure, we know it’s the summer season but can’t we all just go on a cleanse one weekend this summer or something? And this very Saturday will not be different. We wanted to get some work done today, but heck - these events simply won’t let us. Here’s where you’ll meet us today, trying to stuff our faces to forget we should have been sitting at home behind our laptops. We love food festivals. Heck, we spent two hours stuck on the highway just to get to the Brno Street Food Festival a few days ago. It’s a great opportunity to taste many dishes and foods in one place, meet the people behind the food you love and foodies like yourself to chat, share some tips and exchange notes. For foreign visitors, food festivals are also a great place to blend in with the locals and really get as much flavors from their stay in Prague as possible. We think it is clear by now that we absolutely love immersing ourselves into new cultures when we travel, and we want our guests (and everybody else, for that matter) to do the same while they are in Prague. Today, we want you to experience coming of age as it's done here in the Czech Republic. We want you to visit a high school prom at the famous Lucerna dance hall dating back to 1907 because the "ball season" starts today and lasts until March. "Visit a high school prom? You can't crash a prom just like that, right?" we hear you ask. Yes, you can in Prague. Czech high schools sell tickets to their proms and you can walk in even if you don't know anyone, or speak the language. The tickets are reasonably priced, ranging from about CZK 200 (EUR 7.5 in Jan 2014) to CZK 300 (EUR 11) for a ticket with a table. 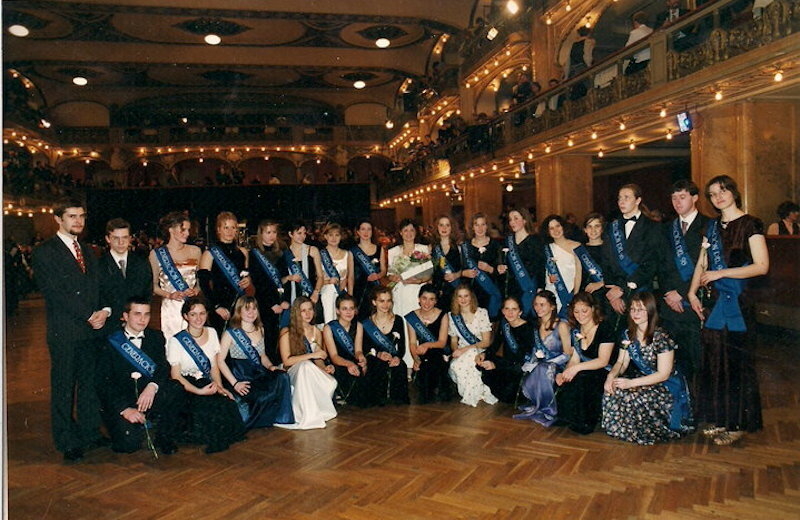 You can see the program of the ball season in the Lucerna hall here (in Czech only). But why should you visit a high school prom? There are so many reasons we don't know where to begin. We think it could be the experience of your trip if things go well. As a foreign exchange student in Houston, Texas for a year in the mid 90s, Jan has been fortunate enough to experience two proms in two different cultures. And boy, are there differences! Firstly, you don't pick a date for the prom. We get awkwardness and embarrassment from an entirely different source: in the Czech Republic, you go to your prom... with your parents. The students dance with their parents and their teachers but as the night progresses, the adults start to leave and the kids finish with a party. Ballroom dancing is a big part of the prom anyway: virtually all high school students in the Czech Republic take classes in ballroom dancing (which is seen as a part of general education here) so they showcase the skills learnt to their parents during the prom. Finally, the Lucerna dance hall is a fantastic place that is closed to public unless you visit a concert or a prom. It surely shows its age but it is a fantastic place for a prom: with a vast dance floor, three stories of balconies, several bars and lots of hidden stairways and corners, you can be both in the spotlight and hidden away, depending on your mood. The dance hall is soaked with history: many great from Louis Armstrong, Jacques Brel or Ray Charles to the Grateful Dead or Marilyn Manson have performed here. So what are you to expect? We've found a nice amateur video that, the kitsch and quality (and the horrible misuse of an Adele song) aside, walks you through the itinerary of a Czech prom quite nicely. First, the dance show: the more talented students (those who took the advanced ballroom dancing classes) do a small performance for the audience. Then the seniors get on the floor, there might be a speech and lots of photos taken. After that (at about 7:50 mark) the individual classrooms collect money for the booze for the party later. Who's throwing the money? The parents and the grandparents, of course. Finally, lots of ballroom dancing and, ultimately, a party. What you should expect, food-wise? Not much, really. Chlebicky, the Czech open-faced sandwiches, are likely to be sold on the spot, perhaps with other small foods. This is not a fine-dining event. Alcohol will be aplenty: lots of beer, harder liquors and wine (although don't expect a sommelier explaining the terroir or the kind of berries you should be getting in the bouquet). The prom is really about "having a ball" in all the possible meanings of the expression. The atmosphere is very cheerful and often emotional. You are parting with your childhood and becoming an adult. One final note and tip: Don't try to get in wearing jeans and sneakers. You will not get in, even with a ticket in your hand - there is a dress code. If you do not have a suit or a dress, we recommend whatever formal you have for the bottom part of your attire and cover the rest with your coat and scarf. Tickets can be bought at the booth in the Lucerna palace directly or in any of the Ticketpro points of sale beforehand (for some proms only). Have fun! If you decide to go, share your experience in the comments below (incl. photos, if possible).